His name was David Polak, but at Dora-Mittelbau concentration camp he was 89896. David was born to a Jewish family on April 3, 1925 in Bachko Petrovo Selo, a town in what was then Serbia, Yugoslavia. In May 1944, at 19, he and his family were deported to the brick factory in Szeged, Hungary, and from there David was deported five additional times, the first of which was to Auschwitz. At Auschwitz, David was separated from his family when he returned to the freight car they’d been transported in to retrieve his grandfather’s coat. Another deportee pulled David into a line of young men who’d been selected to live. A German officer chose 300 men with factory experience and mechanical skills, David among them, to be deported from Auschwitz to a German factory in Villerupt, France. There the men were tasked with moving stones and building a new camp, but were soon moved to yet another location where they worked on V1 rockets until that factory was bombed. After the factory bombing, this group of 300 men was sent to Dora-Mittelbau concentration camp. It was late summer, 1944. Upon arrival at Dora-Mittelbau camp, David received a number on a cloth strip: 89896. Turned upside down, the number reads 96868. With the ability to ‘change’ numbers, David was able to move around Dora-Mittelbau – and to be a saboteur. He was young, and he was small; the Germans didn’t suspect that he was working against them. They gave him a job testing pressurized metal balls that he believes were used in weaponry, perhaps as shells. Another prisoner, an engineer, showed David how to sabotage this work. In Dora-Mittelbau, prisoners with access to coins would flatten them and create bracelet plaques. 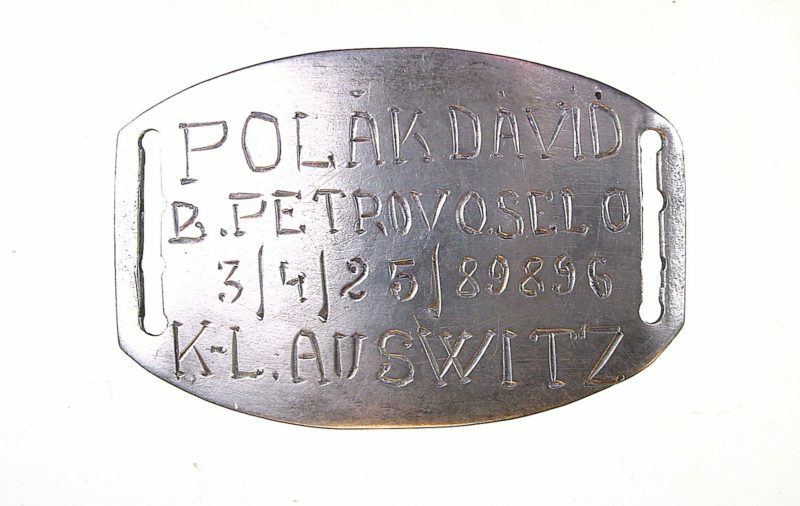 David had a bracelet made for himself, with his name, where he was born, his birth date, his Dora-Mittelbau camp number, and the first camp he was sent to, Auschwitz, though the engraver misspelled it as ‘Auswitz.’ The ‘K-L.’ in front of ‘Auswitz’ is an abbreviation of Konzentrationslager, the German word for concentration camp. David purchased the bracelet for two portions of bread which he paid in four installments. He wore the bracelet on his wrist, using leather straps he cut from a shoe. When Dora-Mittelbau camp was evacuated toward the end of the war, David was moved by train to a camp near Brandenburg, Germany. During the transport, the train car was attacked by Allied bombers and David was hit in the knee, a wound which was swollen and infected upon arrival at the camp. It was at this camp that David was liberated by the Soviet army. David Polak’s Dora-Mittelbau camp number and bracelet are among the Museum of Jewish Heritage collection artifacts on display in the upcoming exhibition Auschwitz. Not long ago. Not far away.